Video gaming is being blamed on the drop in kids' physical fitness and as gamers we can see how this can be true. Sitting in a chair and starting at a screen for long periods of time just can't be good for your body. With the right information though, it really isn't that hard to keep in shape while you play video games. Motion Gaming: Use motion-sensing gaming systems like the Wii, Kinect for Xbox, and PS Move titles for PS4. These games can give you a pretty good workout while still being fun. Sports and dancing games are a great way to compete against others and get your blood pumping. Exercise Bike: You can play almost any single player game while cycling. It's a good workout and it beats sitting down in your gaming chair for hours though. It really isn't that hard to keep in shape even while you're gaming. Below are some easy ways to make sure you are looking after your body whilst still enjoying your video games. Take Breaks: Schedule breaks every few hours for at least ten or fifteen minutes and get up and walk around. You'll feel better when you sit back down and you might even play better too. Work out during loading screens: Every time a screen has to load, there is a death, or a pause in the game, use it to your advantage. Do some pushups every time you die, jumping jacks or situps during screen loads, or some free weights during these short breaks in your game. Pretty soon you are going to notice a change in your body. 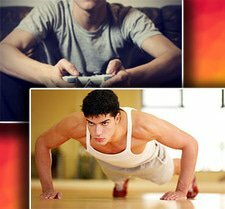 During every load screen, pause, death, or whenever you aren't using your controller, do short, intense, exercises that will keep you active without disrupting your game play. The best games that provide opportunities to work out while gaming are online multi-player matches like Halo, Call of Duty, etc. On average, you have to wait a minute or two for a new game to start. Any game where you have to wait for something to happen will give you the chance to get in some exercise. If you think one minute isn't enough time, do yourself a favor and set a timer for a minute. Now do some push-ups. How many did you get? I'm betting you got at least 10 or more. Now add that up over an average Halo match and you are looking at nearly 8 minutes of exercise or 80 push-ups. See how easy it is now? Stay healthy, get up and stretch a bit!